Every property owner will face the problem of a clogged drain at one time or another. All kinds of materials get stuck in toilets, sinks, and drains. As a result, drains start flowing slowly or not at all. In a worst case scenario, the clogged drain will cause nasty overflows, and bad smells. You can try plunging or snaking the drain on your own, but that is only a short term fix. And in some cases, you might end up pushing the clog deeper in the pipe instead of removing it. Besides, it is easy to crack a porcelain toilet or sink with a plumbing snake if you are not properly trained. Once you tried these simple fixes, if it turns out the problem is bigger, you should leave it up to a professional that specializes in hydro jetting pipe cleaning in the Oklahoma City. Hydro jetting is a much more effective way to clean any pipe you have problems with. Hydro jetting is the process of using a high-pressure hose that has a specially engineered nozzle attached to the end. The hose is connected to a water pressurizer, and a water tank attached to the machine as well. Our highly experienced and trained technicians will insert the hose into the drain system through an easy to reach access point, such as a drain cleanout. The plumbing systems in most residential, commercial, and industrial properties are designed and built with drain cleanouts so this usually is not a problem to find. Then, the technician will shoot a powerful stream of water into the pipes to get rid of blockages. As the water is forced down the system it easily moves any clogs and buildup including debris, grease, hair, and minerals, and other materials out of the pipes. 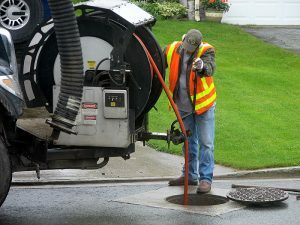 Additionally, water jetting will also remove tree roots growing inside the sewer pipes. Ideally, hydro jetting is more effective before you have clogging problems. Also known as water jetting, this technique is useful in preventing clogs from happening in the first place. In essence it is an effective plumbing maintenance procedure that can be used to keep your pipes and drains in top shape at all times. The question is why would you take the risk of dealing with overflowing toilets and clogged sink, shower, and tub drains when all of that mess can be avoided. It is far more cost effective to schedule a yearly hydro jetting pipe cleaning than calling a plumber. The bottom line is without the proper preventative maintenance plan in place you just never know when a clogged drain will strike. Contact us now to learn more about our hydro jetting solutions. If you have never seen how it works, you will love to see how quick and affordable the whole process is. You will save money in the long run, and your pipes will flow better than ever. Call us at 405-562-1111 to schedule an assessment visit or get a free estimate.